All DK runes are now just “runes.” They are no longer split by type. They are all what used to be called “Death Runes,” usable for any ability that uses runes. Death Strike now uses Runic Power instead of Runes. As Unholy you now have one disease, Virulent Plague, which spreads on its own, much like the Necrotic Plague from Warlords. You also have Festering Wounds, which are delivered by your Festering Strike. Your Scourge Strike pops the wounds for additional damage and more Runic Power. See our Death Knights in Warlords post for more detail on all of those changes. This Unholy Death Knight guide is primarily intended for PvE and Raiding at level 100. However, the principals will still apply during the leveling process. If you’re looking for advice on leveling your Death Knight, check out our Death Knight Leveling Guide. In Legion your talents can easily be changed IF you’re in a “rested XP” area, such as your garrison, an inn, or the big city. No reagents, trainers, or special rituals required. You can change your spec (go Frost or Blood) at any time that you’re out of combat, but for the individual talents you need to get to the rested area. As with changing specs, no special items are required for changing talents, you just have to be home, out of the raid. All Will Serve: A passive dps increase that happens to best on single target. Bursting Sores: The best talent for most cleave (2+ enemies) situations and pretty close to All Will Serve for single target. 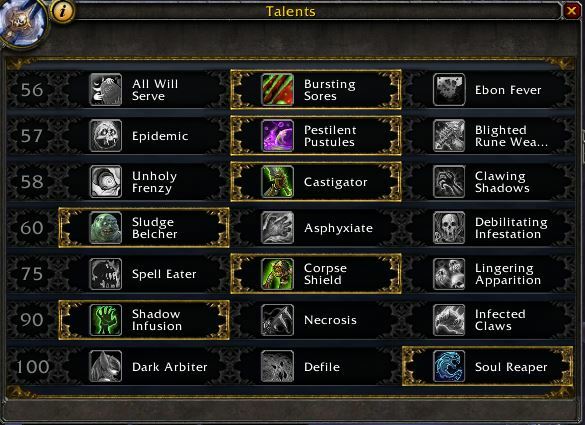 Since you can’t change talents on the fly this will be the best overall pick if you’re looking at mixed encounters. Ebon Fever: Makes Virulent Plague do all of its damage in half the time. Useful for fighting packs of short lived mobs. Epidemic is by far the best talent in this tier for any sort of burst AoE. Let ’em all get infected then blow them up. This could have very interesting utility with large groups. 3 charges and a quick cooldown. Pestilent Pustules: Should take this one just for the name… Your rotation is, in part, creating and popping Festering Wounds and this talent gives you runes for doing so. It’s the best overall pick. Blighted Rune Weapon: A talent that you can only take when also talented in to Bursting Sores. Blighted Rune Weapon is only useful on AoE where you have set up and in Legion there just are not any scenarios where this talent is good. Unholy Frenzy: A mostly passive talent that significantly increases your auto attack damage and increases the generation of Sudden Doom procs. It doesn’t do enough to compete with the other two. Castigator generates many more Festering Wounds and consumes them just as fast. It makes it easier to build up wounds on new targets as well as doing significantly more damage overall. Clawing Shadows is basically a ranged Scourge Strike. If you need to be a caster instead of melee, and you still have to apply those wounds, then maybe this would be useful. Most of the time Castigator will be much more effective. Sludge Belcher: For any sort of PvE content this is almost mandatory. With this pet giving us a second grip, via it’s “Hook” ability, it is simply the best overall pick in this tier. Debilitating Infestation: This talent applies a slow when you cast Outbreak. Not generally as useful as the other two, especially if someone on your team already has slows. This pick really depends on the set of fights you’re about to enter. Spell Eater: Unless you are on a very magic-damage-heavy fight, there is little justification for taking this talent. Corpse Shield gives you a 90% reduction to all damage. Corpse Shield: We’ll probably lose our ghoul if we take too much damage during the duration of the buff. With this in mind, this talent has great synergy with All Will Serve. If you are taking high sustained damage, you can constantly resummon your pet to keep the 90% damage reduction up for as long as possible. This talent has a lot of niche uses and will save you from a lot of damage and deaths. Don’t forget to activate your pet’s own defensive ability (Huddle or Protective Bile,) which will keep it alive longer. Lingering Apparition: More mobility is never bad, especially since yours is lousy. If you don’t need the defenses of the first two, then it’s a good pick. Shadow Infusion: Enables a much higher of uptime on Dark Transformation due to Death Coil reducing the cooldown of Dark Transformation by 5 seconds when Dark Transformation is not on your ghoul. Infected Claws: More Festering Wounds since your ghoul/abomination can now deliver them. Note that it now becomes that much much easier to cap out your Wound stacks, making additional applications useless. If you’re efficient at popping wounds then this is a definite plus to your damage. Dark Arbiter: Dark Arbiter replaces your Summon Gargoyle. While it’s a pretty nice improvement to that Gargoyle, it’s outclassed by Soul Reaper. Defile: If enemies are with in the area then it grows each second of its duration. As it grows it adds to your Mastery stat and your Scourge Strike will hit all targets within range. It doesn’t seem to be as effective (damaging) as the other two, though it might shine with large groups. Soul Reaper: If you have Apocalypse then this talent becomes a lot easier to play. Due to Apocalypse popping wounds, you can easily line up Soul Reaper and pop 8 Festering Wound with Apocalypse to get the max value out of this spell. If Apocalypse is not up, you should have at least 3 Festering Wounds on the target (for maximum haste) before casting Soul Reaper. This is the best pick of the three for most situations, even without Apocalypse. Nothing like changing your pet’s appearance to improve your DPS, right? Glyph of blood boil increases your area of effect for Blood Boil. Glyph of Regenerative Magic allows more frequent access to your Anti-Magic Shell if it didn’t get used up the last time. Ultimately this will help you to gain more Runic Power over the length of the fight. Glyph of Raise Ally for those rare times when you’re raising people from the dead. The cost is removed. Glyph of Empowerment heals you for 30% when you use your Empower Rune Weapon ability. Glyph of Icy Touch adds a little more Dispel capability if your team needs it. Glyph of Outbreak removes the cooldown from your Outbreak, but that ability now cost 30 Runic Power which you might rather use to empower your Ghoul. Glyph of Unholy Command is useful if you’re on “add duty.” Each time you kill something your Death Grip cooldown is immediately finished. For most classes the minor glyphs are mostly just cosmetic, and so are most of yours. There are, however, two pretty important ones that you want to take for your PvE teams (dungeons or raids.) They won’t matter if you’re solo or in PvP. Glyph of Tranquil Grip is required as it removes the taunt effect from your Death Grip, a very useful glyph in the event that you need to use Death Grip on an encounter as it avoids disrupting the tanks control of a mob while still allowing you to maneuver it with Death Grip. Glyph of Army of the Dead – Also required, since you’re not the Tank you don’t really want your ghoulies taunting things, do you? This removes that ability from them. Glyph of Death’s Embrace – Useful for healing your pet. Glyph of Path of Frost – Because from time to time you just might take a fall. In Warlords the Hit, Expertise, Resilience, and PvP Power stats are all dead. Reforging is dead. You have two new stats, Multistrike and Versatility, and the former is your “attuned stat.” An attuned stat is one in which you get an extra 5%, and yours is Necrosis, gained at level 90. Strength improves everything you do. All your attacks are based on it. Mastery boosts your Shadow damage, which is pretty important to Unholy. Crit is simply a damage boost. The Castigator talent allows more Festering Wounds, and more bursts, from your crits. Versatility is a small add to your damage, healing, and damage reduction. Haste lets you do everything faster, including your attacks, disease speed, reducing cooldowns, and so on. Click here now to get your Unholy self to 110 ASAP! Rune of the Fallen Crusader is the best of the Runeforges for you. Use Festering Strike to apply Festering Wounds and Scourge Strike to pop them. The goal here is to have your empowered ghoul up as often as possible. Dark Transformation is now a buff with a one minute cooldown. It should be used whenever it’s available. Note: Defile hits harder than Scourge Strike if your target will last long enough and is stationary, so should be used on cooldown, even against single targets. Save it if adds will be coming in shorty, so you can attack all of then with the Defile. Use Runic Power for your Death Strikes and Death Coils. Army of the Dead should be used when engaging a boss. They’ll swarm the area and attack everything, including any CCed targets. Quick Dawnlight for +250 Haste or Deadly Eye of Prophecy for +250 Crit. Gem for Str and Crit till you get Mastery at 80, then Str & Mastery. “Perfect” gems will have the same stats and likely be differently priced. Get whichever is cheaper. Strength is easily the #1 stat, but Draenor gems do not carry the primary stats (Str, etc.) You will be gemming for Multistrike. The gem themselves are actually available. They are all prismatic, meaning they fit into any socket. None have Int, they all have secondary stats (Mastery, etc.) There are no Meta sockets or Meta gems. In Legion, as it was in Warlords, you can only enchant Cloaks, rings, and neck items. Weapons are artifacts and cannot be enchanted, though the can be customized through other means. No other items can be enchanted. If you want to buy the best enchants, fund all of your alts, donate to the guild, etc., but don’t have the cash, then see what the Tycoon Addon can do about about fixing your poverty. Note that head enchants are gone in Mists of Pandaria. Shoulder enchants all come from the Inscription Profession. Warlords enchants are only for jewelry, cloaks, and weapons. Rune of the Fallen Crusader: +20% Str proc beats any other Warlords enchant, plus you get the 6% (with the perk) heal proc. Note: There is a “breath of” version of this enchant which has the same stats, but without the 10% movement bonus, and which is a lot cheaper. It used to be that any gives profession would give you a bonus to your best, or some, stats. Blacksmithing, for example, would give you two extra slows for your gems. In Warlords there are no professions bonuses. No special stat boosts that characters without the profession cannot get. Leatherworking Leather and mail armor, if your garrison LW shop has the follower minion you can make tents which will give you a 10% boost to all stats. This boost cannot be used in raids. Clearly the Undead are far and away the best choice for Unholy DKs. Their racials don’t add any DPS, however. None of the racials are very important to Unholy DPS. 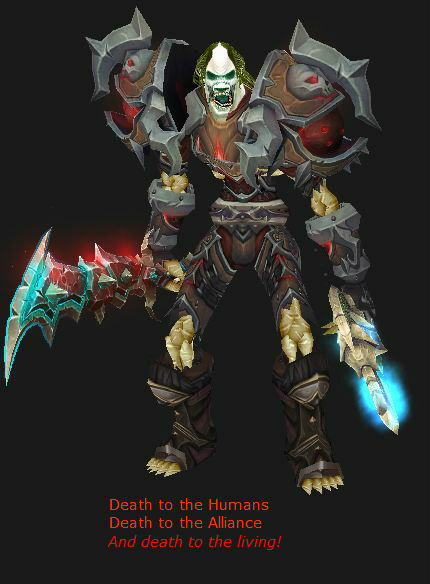 In Warlords the Pandaren still cannot be Death Knights. All racials covering Hit or Expertise have been removed. New racials have been added to some races. Note that all races now offer something to add to your DPS. Human – Escape ability can break some PvE mechanics. Faster Rep gain. +2% to all secondary stats. Draenei – A small heal over time is nice, bonus to Str. Gnome – Added Runic Power, escape might occasionally be useful, +1% Haste. Night Elf – 2% extra dodge is barely ever useful for you, shadowmeld has some very situational use, such as when the tank loses aggro. 2% faster movement, +1% crit by day which changes to +1% Haste by night. Dwarf – Stoneskin sheds some effects and reduces damage, +2% critical effect to damage and heals. Orc – Blood Fury for more damage, Command for a tiny bit more damage from ghoulie. Stun resistance will only rarely be of use. Troll – Increased attack speed for 20 seconds. Goblin – Rocket Jump can be a useful movement ability, 1% Haste is a decent stat. Undead – Minor DPS ability in Drain life (which drains them and heals you. It also scales with your Mastery, since it does Shadow damage.) Also wash away fear, sleep, charm. Indefinite underwater breathing might have some use, somewhere. Tauren – Increased Stam, War Stomp stuns close opponents, +2% critical effect to damage and heals. Blood Elf – Arcane Torrent silences (trash) casters and restores some Runic Power, +1% to Crit. Warlords note: There are no new DPS Elixirs, but there are for Potions and Flasks. There are no Str foods, either. Ditto for Legion. Suramar Surf and Turf for +300 Haste. The Hungry Magister for +375 Crit. Or maybe Spiced Rib Roast for a chance for your really spicey breath to spew forth fireballs to damage the enemy. Unholy Death Knights to a ton of damage and have solid defenses, so leveling is going to be easy. Still, there are thousands of quests and a bazillion mobs to kill (not to mention other players, but they don’t count here.) Sorting out which quests are best and which series of quests will get you to 100 the fastest is the issue, otherwise you can waste a lot of time running hither and yon, getting nothing useful done. 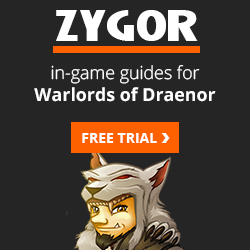 This is why we highly recommend Zygor’s Guide.